Now that our friend Tina gave us a breakdown on Indian wedding ceremonies, it's time to talk about Indian wedding guest fashion! Now, Indian / Pakistani clothing can be very expensive, so we don't recommend going out and buying a new outfit unless you'll have multiple occasions to wear it. We do recommend borrowing clothes from a friend or investing in an outfit with a friend who is a similar size, so you get the most use out of it! For those of you who have reason to invest in a new outfit, here is a break down of basic styles. The sari is the most traditional Indian outfit which most people are most familiar with. The base outfit is a long skirt and fitted cropped top, which you then wrap around with a thin, beautifully patterned fabric. It can be a little difficult to figure out how to wear a sari, so make sure you have some help! The lengha is the most common outfit for brides during the reception which consists of a long, floor length skirt and a shorter top. 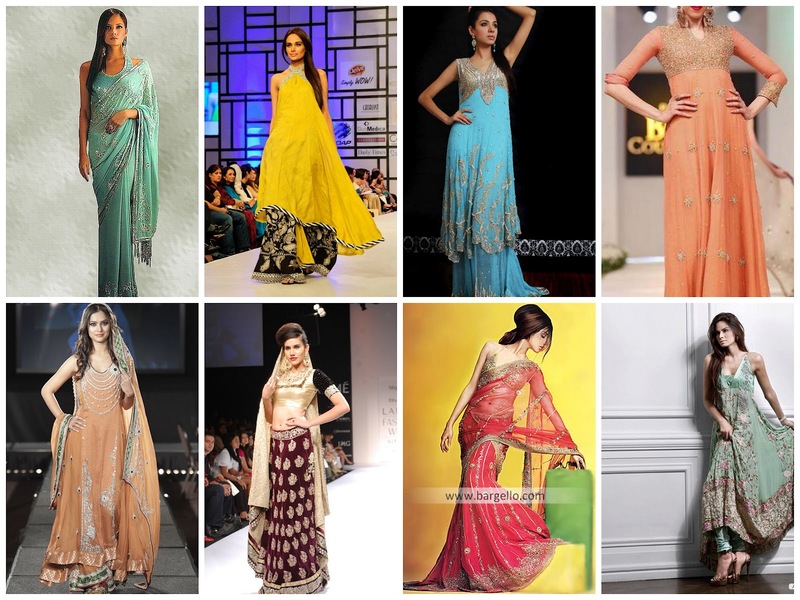 The length of the top depends on the style of dress -- Indian style tends to include a more cropped, fitted top, whereas Pakistani style will include a longer top, sometimes even going down below the knees. The most basic outfit is the salwar kameez, which is pants (either loose or narrow) with a longer top. The current trend is to wear a very long top (almost floor length) with very tight fitting trousers (almost like leggings). Because the fashion changes all the time, we recommend investing in something that hits right below the knees, which is a classic look that is suitable for both Indian and Pakistani weddings.